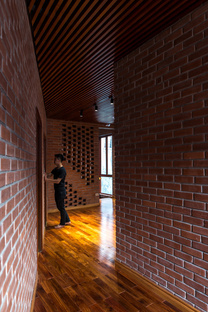 H&P Architects’ Brick Cave project in Thuy Lam, a suburban commune north of Hanoi, reflects the interesting trend among a number of Vietnamese architectural studios to focus on the country’s rapid urbanisation and progressive loss of its rural character. In recent years we have published projects by young Vietnamese architects from Vo Trong Nghia to Tropical Space whose work has focused on definition of the minimum requirements for the country’s new society. They focus on the need to incorporate landscape into buildings, an essential need in Vietnam’s urban and suburban areas in these times of mass migration into the cities. Unrestricted construction over recent years has made urban greenery and the rural component that has always dominated the Vietnamese landscape increasingly rare. As in Vo Trong Nghia’s Bihn house and Tropical Space’s LT house, the phenomenon of massive construction inspires creation of green spaces grafted right onto the home. Doan Thanh Ha and Tran Ngoc Phuong of H&P Architects use all the available space by making the perimeter of the new home coincide with the perimeter of the lot. The walls, composed of a double layer of brick, with a large covered space in the gap between them, constitute both the outermost and the innermost boundary of the home. On the first level, the walls on all four sides of the building are perpendicular to the ground; but above 2.55 metres, the walls are inclined, at different angles on different sides, for two floors, up to a height of 7.80 metres, above which is a rooftop garden. On the urban scale, the building thus created becomes a big wrapper closed in on itself, but with a perforated brick skin that makes it a vital living organism interacting with its surroundings. With plenty of windows, the wall acts as a permeable filter in which light, noise, the sun’s rays, moisture, cold and all the effects of the weather are gradually attenuated from the outside inwards. 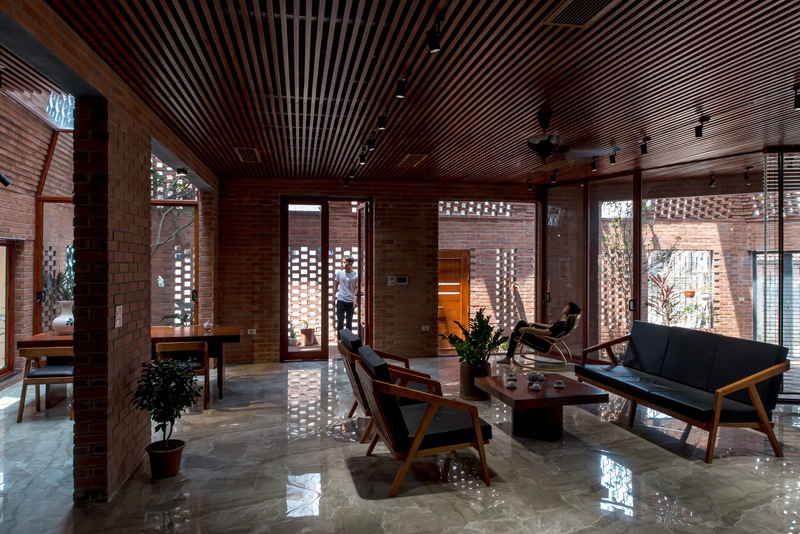 But the Brick Cave is by no means dark: its many windows, with sunbreaks created by patterns “sculpted” into the brick like big shutters, create diffuse indoor lighting, soft and constant in all the rooms, avoiding strong contrasts. 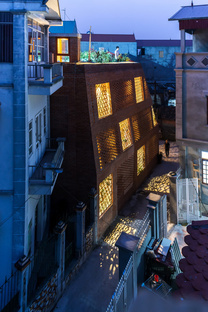 The bare brick draws on Vietnam’s history but stands out from the many anonymous buildings in today’s suburbs, as confirmed by the dividing walls and structural walls inside the home, which are anchored to the outer walls by girders on the flat roof. The residence consists of a very large living room occupying the whole ground floor and a bedroom area with two bedrooms and generously sized sitting rooms and hallways on the first floor. The entire roof is covered with a garden, containing a water cistern. The home’s relationship with the street and the neighbourhood is mediated by the filter space in the gap between the two walls around its perimeter, a covered garden as tall as the building, so that trees can grow naturally, their foliage emerging through the openings in the diagonal walls, adding interest to the neighbourhood. The building’s irregular floor plan creates asymmetrical rooms, permitting views from room to room and improving natural ventilation. On the east side, containing the main door, two balconies on the inner wall jut out toward the outer wall, as if in a laneway between buildings. The philosophy of the protected microcosm, offering the neighbourhood signs of the life going on in the little community inside it in the evening, encourages new ways of imagining living at a time when the city is rapidly changing.